For these stamping swatches I used my yellow medium soft stamper head from Messy Mansion and various Born Pretty stamping plates from the BP-L001 thru BP-L008 plates. I stamped each polish over black and white. First up is Blue and Steel. Blue is a nicely pigmented metallic blue, and steel is a dark silver. Crimson and Lilac. Crimson is a medium pink and lilac is a pale lilac silver. Silver and Green. Silver is a classic metallic silver and green is a pale golden green. All of these polishes stamped perfectly. They were nice and thick and slow drying on the stamper, so you don't have work super fast like you do with the Sally Hansen or Layla chromes. I really love the colour of blue and crimson, but I wish the colour differences between steel, silver and lilac were more obvious. The colour in the bottle seems brighter and more coloured than the finished look on your nail. 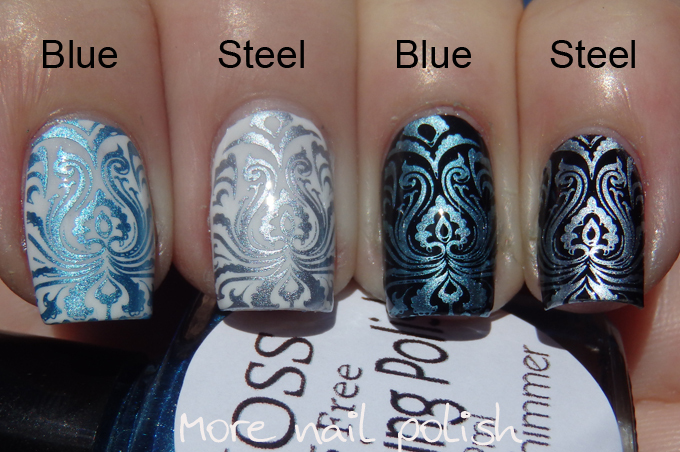 The JOSS Stamping polishes are available from The Nail Super Store and are AUD$6.95 for a 9ml bottle. Plus they are all 5-Free, so you know what you are stamping on your nails. Keep a look out for your chance to win a full set of these polishes in my up coming 5 year blog anniversary giveaway. Blue and crimson are lovely! I hope I can find these in the US soon! Dance Legend Round Space Collection.